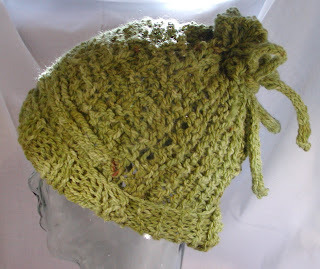 This is the hat that I created using a freeform technique. It turned out really well and, depending on which end you gather, can be a small or medium. While teaching the freeform class yesterday, I came up with an idea for a way to start using some of the millspun that I got back last week. 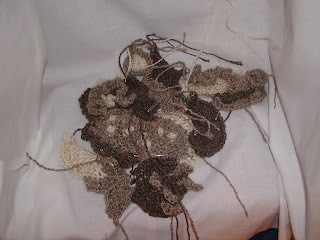 By mistake, I came up with a new stitch that I can use to create little flowers as I am knitting. No ends to weave in, if I spin a yarn that has the right spots in it. I have white kid mohair and some lace weight to spin for the green crochet shawl pattern before I can start experimenting with the new yarn. Too many ideas and not enough time!